Rebecca Makkai’s work has appeared in The Best American Short Stories, The Best American Nonrequired Reading, Harper’s, Tin House, McSweeney’s, and Ploughshares, and has been read on NPR’s Selected Shorts and This American Life. She is the author of two novels: The Borrower, a Booklist Top Ten Debut, an Indie Next pick, an an O, The Oprah Magazine selection; and The Hundred-Year House, wihch won the Chicago Writers Association's Book of the Year Award and was named a Best Book of 2014 by Bookpage, PopSugar, Chicago Reader, and more. The recipient of a 2014 NEA Fellowship, Makkai lives in Chicago and Vermont. “Makkai proved in her most recent novel, The Hundred-Year House, that she's capable of crafting alluring, interwoven character studies. In Music for Wartime, she's penned a series of short stories—three of which are based on legends from Hungary, where her family hails from. Spanning Berlin, Romania and present-day America, where true love can be found in front of a live audience, her short stories are as moving as they are varied." “After two celebrated novels . 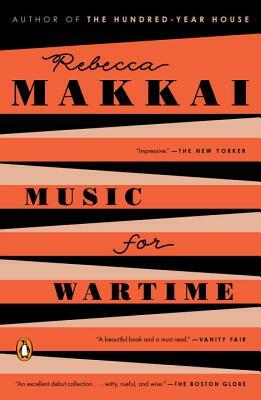 . . Makkai returns to the genre that first got her noticed. The stories’ settings vary . . . [with the] author’s sharp, compassionate writing uniting them all."